To Begin With This is a simple game of comparing two hands, one the player's and the other the dealer's. Their value is the simple total of the cards in them. Picture cards count as 10 and an Ace can count as either 1 or 11. The Object The object of the game for the player is to beat the dealer by achieving a higher total without exceeding 21. Hands that total more than 21 are considered to have Bust and the bet associated with it is lost automatically. The Play You sit down at a Blackjack table and place your cash money on the table in a way that lets the dealer know you want to play or click on the Blackjack game screen in your online casino. The dealer will exchange your money for cash chips with which you can start betting. There are table limits that mean there is a minimum bet and a maximum bet. Beginners If you have never played before then you should be aware that there are accepted ways to behave at the table and you may want a more complete Beginners guide to blackjack that can explain more of the history and etiquette. Before the deal begins, players must make a bet which is placed in the box marked in front of their seat. When this is done the dealer will deal one face-up card in front of each box that has a bet in it, one to themselves, then a second face-up card to each active box. Cards are dealt from a shoe that contains the pack. The pack is four or six decks shuffled together (UK). When all players have two cards each, the dealer will return to the box closest to the shoe and ask the player of that box what action they would like to take. This action can be one thing at a time from a list of possible options, depending largely on what cards the player's hand holds. If the player holds an Ace with a 10 (or picture) then they have a BJ which is paid immediately at odds of 3/2, unless the dealer has either a 10 or an Ace as their card. In this instance the deal continues to a finish because the dealer may achieve a BJ themselves and therefore the hands will be tied, which is a stand-off. Stand If the player is satisfied with their total they may elect to stand, in otherwords take no further action with this hand. To signify this the player must either say "no card", shake their head in an obvious manner or pass their flat hand (knuckle up) sideways over the table. All gestures must be unambiguous. Online you will have buttons to press. Draw If the player wants to try and improve their total they can draw a card. This is done by saying "card", by touching the table in front of them or by nodding their head. This can be done until either the player is satisfied with their total (when they will stand) or their hand is bust. Double You can double any hand. This means increasing their bet by exactly 100% (doubling it) and receiving one (and only one) further card. Split If the first two cards have the same value then the player may elect to split them. This means that they will be separated and form the basis of two new and separate hands, each receiving a second card dealt by the dealer. The player will have to increase their bet by an equal amount to allow each of the new hands to have the same bet as the original one. Now each hand is played in turn and further splits and doubles and draws are allowed. If you split two aces, you receive only one additional card for each ace and split hands can not make Blackjacks. Insurance If the dealer shows an Ace in his initial hand, you are given a chance to insure your bet against him having a Blackjack. 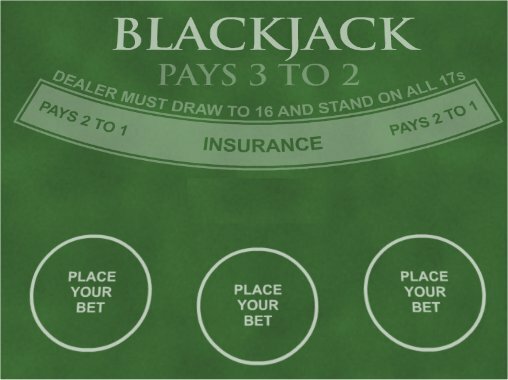 If you get Insurance, an amount equal to half your original bet is placed separately on the table. If the dealer does have Blackjack, you are paid 2 to 1 on your insurance. This way you do not lose your original bet (because you get the 2x half your original bet, plus the insurance amount back). If the dealer does not have Blackjack, you lose the insurance amount. 10 Card Charlie It is theoretically possible for the player to draw 10 cards without going bust. In this case the players hand automatically wins, except when the dealer has Blackjack. 10 Card Charlie is also applicable on a split hand. The Dealer's Hand When all players have finished their actions it is the dealers turn to take cards. The dealer must take cards until their total exceeds 16 when they automatically stop taking cards. If they have a total greater than 21 then their hand has bust and all remaining hands are paid at even money except BJs which are paid at 3/2. If the dealer makes a hand then it is a straight show-down between the dealers hand and each individual player hand. The highest hand wins and all ties are stand-offs. Winning hands are paid at even money, BJs at 3/2. Losing hands forfeit their bet. A dealer's BJ beats all hands except a player's BJ, when its a tie. Special Rules From time to time the casinos will come up with side bets. The standard side bet will always be a bad bet when dealing straight from a fresh deck but there are techniques to beat real world Blackjack that includes side bets. We will add new articles to discuss these.